I'm not an expert when it comes to insecticides. In Denver we had little insect pressure in the patch. However, it only takes one squash bug for your pumpkin plant to get yellow vine disease, so spraying appropriately can be important. I would prefer something that is friendly to bees, but haven't found anything that will work for me yet, but if you have any advice, let me know. Once every two weeks I'll be spraying bifenthrin and on opposite weeks I'll use Orgaocide. This will help make sure I have full coverage. I ended up waiting one more day, but I couldn't wait any longer and got the plants out of their hoop houses today. The 747 was almost 2 feet beyond the hoop house and a side vine was hitting the side of the hoop house. I buried vines on both plants today and then sprayed the entire patch with beneficial bacteria and myco. After that I put up wind fences (a little windy this afternoon but nice temperatures) and watered the plants. I had a hard time deciding between the two 1685 plants. In the end it was a 50/50 coin toss, because they were pretty similar, so I hope I chose the right one. I really like the looks of the 747 plant. It reminds me of the clone plant in a lot of ways. Fairly aggressive grower, skinnier vines, but larger leaves like the 1985 plant had. After that nitrogen, the main vine grew almost a foot yesterday. A lot of vine burying to do in the next few weeks for that plant. Both the 747 and the 1685 plant have a female flower that just showed up in the vine tip today. I'll pollinate both, but I'd prefer not to keep that one on the 1685 plant. It hasn't filled out much yet and I'd like to see it bigger. The 747 plant has that female at almost 10 feet. If something else shows up in the next four feet I'll pollinate it too, but very well might just keep this one at 10 feet. That plant is growing fast enough right now that it should be in pretty good shape when that female opens up in 10-14 days. 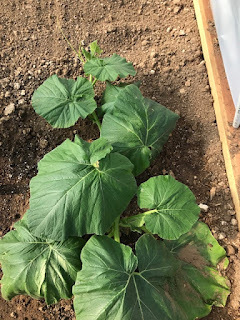 One of the reason I started this giant pumpkin growing blog is so that I can look back on previous posts to make comparisons and remind me what I've done. This season I start my pumpkin plants about 10 days earlier than usual. Although that gave me some problems early, it looks like they are in good shape now. I need to come up with better strategies for the early season, because of my environment, but it isn't how you start the race, but how you finish. I just went back two years ago and four years ago and took a look at the pictures of my plants on the same number of growing days using this blog. I was surprised to see that my 747 plant is ahead of the plants from both of those years by a couple of days and the 1685 plant is on par with the plants from those years. I figured I was probably just a little behind. I suspect I'll be pollinating pumpkins sometime in the next two weeks, so right now I want to grow out this plant as much as I can. The previous weeks were about root growth, now we transition to growing the plant big. Today I have my plants their first real dose of nitrogen to help support the vine growth. The plant is going to need a lot of nitrogen to support the vine growth over the next month, until the pumpkin starts taking off, so you need to make sure it has what it needs. I gave my plants some blood meal (which is a good source of nitrate nitrogen and iron) and NPK Grow formula (7-4-5). I am just spoon feeding them however. About a 3/4 tablespoon of each poured down a drench. During vine growth the plants need a little more nitrate nitrogen and the blood meal gives them what the need. The ammonia sulfate in the NPK Grow formula is the easiest form of nitrogen for plants to take up, so it fairly immediately used by the plant. I also gave the plants a little B-vitamins. These put the plant on systemic alert and will help the plant when I take the hoop houses off of them in the coming days. Coming days will finally be warming up in the low 80s, which will be good. Nighttime lows will finally be in the 40s, which isn't ideal, but compared to what I've had I can get the plants out of the hoop houses without much fear of them freezing. The lows tonight are for around 39 degrees, but the 747 had outgrown its hoop house yesterday, so I added an extension on it. Will be tilling this cover crop in starting this next week. I'll slowly start tilling it as the plant grows out. I took off the hoop house on my 747 Johnson pumpkin plant because I needed to re-position it to give the plant as much space as possible. I'm getting near to the end of the hoop house but I really need to keep that plant in the hoop house until Monday. Not sure if that is going to work our or not. Lows in Midway will be in the high 30s over the next 4 days, so I don't want the plant to be outdoors. Pictured here is the 747 plant. The plants always look big in the hoop house and small when you take them out. I buried the main vine while it was out of the hoop house and put down some myco and beneficial bacteria at each leaf node. By burying the fines, you'll get roots to come out of the top and bottom of the vine at the leaf nodes and by the end of the season you'll have a root system that is probably twice as large. Those extra roots translate to a lot of extra pounds on the pumpkin by the end of the year. I did a mixture of soil from the yard and old compost for burying the vines. This compost is probably 1-2 years old and it looks more like dirt than compost. I know it is same to put on the vines because the compost pile has no heat and there are weeds growing on it. If the compost wasn't completely broken down the heat from the compost could burn the roots. I apologize to those who asked to see some picture updates of the pumpkin plants. Been very busy lately. On Saturday I worked eight hours in the yard (feeling it today) getting ready for sod that is finally arriving on Tuesday and I haven't had time for much of anything else. I still need to get the sprinkler lines in for the pumpkin patch, so Memorial Day weekend that will be one of the main things I'll be working on. Right now I have two nice plants and two crummy plants. But that is why I double plant in each hoop house. The good news is that I have one good plant in each hoop house, so I'll be pulling the less interesting plants this week. My 747 is becoming a very nice plant and is an aggressive grower. It is about 1 1/2 feet from the end of the hoop house already, which is causing me problems. Morning lows are still pretty cool in Midway (we had snow 4 days ago) and I'd love to keep that plant in the hoop house until at least the 1st of June. My plan is to re-position the hoop house so the plant is positioned corner to corner which will probably gain me an extra 6 inches or so. I'll sure it will still outgrow the hoop house in a week however. The 1685 is starting to shape up to a descent looking plant. Not as aggressive as the 747, but looking pretty good lately. It had a rougher time with the transition to the hoop house, but it is wired up now and read to go. Today I gave the plants a fair amount of compost tea with a descent amount of alfalfa in it and a touch of phosphorous seaweed. In about a week I'll give the plants some blood meal to start pushing out the vines. I'm hoping to have some fruit set on the plants by June 15th. The day before yesterday I gave the pumpkin plants some omina with a little b-vitamins. Those amino acids will help with the uptake of calcium in the plant and gives the plants a little nitrogen. Yesterday I gave the plants a healthy foliar application of kelp. Kelp gives the plants growth hormones and a number of micro-nutrients. My main objective was to help the plants survive the cold over the next few days. Up on the mountain, maybe just 500 feet higher in altitude there was snow. Temperatures were relatively cold, but lots of light bulbs in the hoop houses and covering the hoop houses didn't let it get below 45 degrees. Not ideal growing temperatures, but it keeps the plants alive. Tonight will be ever colder with a forecasted temperature of 24 degrees. Hoping the power doesn't go out. This Wednesday in Midway, Utah we have a forecasted low of 24 degrees. That isn't good for pumpkin plans (or most any other garden plant). I have my plants in hoop houses, but they don't give much protection when the sun isn't out. With no heat source the temperature inside a hoop house and outside of a hoop house after midnight will be about the same. To keep my plants alive I'll be adding an extra light bulb to each hoop house, a 5 gallon jug of hot water, a blank and tarp over the hoop house and I'll give the plants aminos and seaweed the night before. Aminos help with the uptake of calcium in the plant. When a plant has extra calcium pectate between the cell walls instead of water, injury to the plant is minimized in cold temperatures. It is not uncommon for lettuce plants treated with amino acids to survive hard frosts. Seaweed can strengthen cell walls and as a result help protect a plant from frost as well. The following are my two best plants that will probably be my keepers. Normally when plants are vining like this, I would give them a little blood meal to help push the vines along, but since my plants where in pots so long, I'd like to have the plants root more, so I've held off on nitrogen so the plant will concentrate more on roots than salad. These are my four plants. Fortunately it looks like I have at least have one descent plant in each hoop house. Vines are down on the ground for all the plants now. I need to get the root system going. Being in the pots as long as they were the root systems are probably half the size they would have been if they had been in the ground. I'm not too worried about it at this point. Two years ago we had the worst month of weather in May, ever in Colorado. Literally the plants saw about 5 hours of sun the entire month and it was very cool. The plants were all lime green by the end of the month. 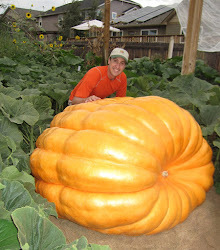 Lots of big pumpkins at the end of the season, because June had great weather and the rest of the year was normal. In May, you need the plants to grow a big root system. In June you need the plants to vine out and grow a lot of salad, so the plant is big enough to power the fruit in July. I got the plants into their hoop houses yesterday evening. I would have to say they are the biggest plants, but worst looking plants I've ever planted in hoop houses. The plants have been in their pots too long and it has set them back some. If everything was ideal, I would put the plants into their hoop houses when the first true leaf appeared. I'm way past that and have plants are vined out. That means a fair amount of top growth but not the root system to support the plant. I'm guessing the plants for the next week will really struggle before wiring up and getting into gear. The other issue I've had is time. April is a tough month with everything going on and rather than taking care of plants, I've been setting up hoop houses, doing prep in the patch setting up irrigation lines. I don't expect any personal best pumpkins this year, but hopefully the pieces being put in place now will pay off next year. It is hard when you are trying to play catch up this early in the season. In each planting hole I put NPK Microbes, myco, Azos and Actinovate beneficial bacteria and fungi. I then watered the plants with some liquid seaweed, B-vitamins, mono-ammonium phosphate, fulvic acid, silica, alfalfa and humic acid in the water. Last night got colder than foretasted. 33 degrees at one point. Plants seemed relatively fine in the morning however.